UPDATE: The AMBER Alert has been canceled. Police say the suspect is in custody and the children are safe. 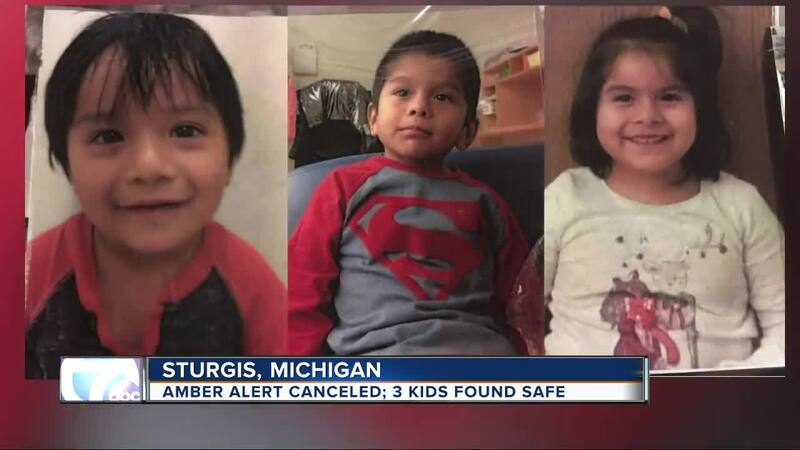 An AMBER Alert has been issued for three children reported missing from Sturgis, Michigan. Sturgis Police say they responded to a domestic complaint where the father allegedly assaulted the mother and took off with the kids. The father, Fernando Mendoza Cruz fled with 2-year-old Aldo Cruz, 4-year-old Matteo Nieves and 5-year-old Chelsey Lopez. Fernando Mendoza Cruz is believed to be armed with a handgun. Police are looking for a black 2009 Chevy Traverse with the Michigan license plate number: DWH9204. Investigators believe Cruz has been near Freemont, Indiana. Anyone who sees him is asked to call 911 or Sturgis PD at 269-651-3231.